Century Cycles Blog: A Comfort Road Bike? What do you get when you cross an Electra Townie comfort bike, with its Flat Foot Technology and comfortable upright riding position, with a road bike? The result is the Electra Townie Sport series. 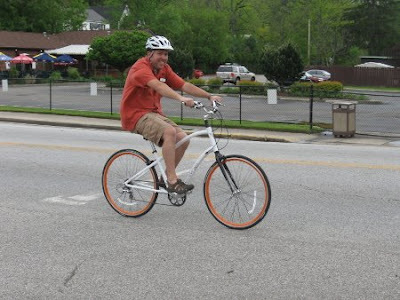 Our Electra sales rep Gary Thomas stopped by the Peninsula store on Thursday with the Electra Townie Sport 105 bike for us to try out. There are some things in this world that you love to hate (like Huffys, Big Macs, and John Tesh), and there are some things that you hate to love (like Law & Order, McGriddle sandwiches, and Natalie Merchant). This bike falls squarely in the second category, in my mind. 4 out of 5 of us who tried it agreed that we were surprised how much we liked it. It's amazingly light and fast for such a comfortable bike. It's got components that you'd be glad to get on any mid-range road bike: Shimano 105 rear derailleur and cassette, FSA compact double crankset, dual-duty pedals that will work with sneakers or click-in cycling shoes, and Shimano Rapidfire shifters that are as sure and smooth as you'd find on any of our top-of-the-line fitness bicycles from Raleigh or Giant. They're all attached to a lightweight aluminum frame and fork that rolls smoothly on Maxxis Detonator 700x28 tires. The Electra Townie Sport 105 sells for $1,299.99; it also comes as the Electra Townie Sport Tiagra for $899.99, and the Electra Townie Sport 2200 (Men's or Women's version) for $599.99. I even have a helmet on, YEAH for helmets. 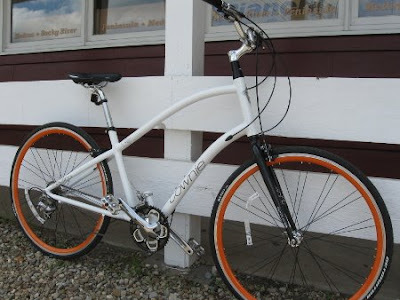 i want to buy this bike! how can I find one! Unfortunately, Electra no longer makes this model!